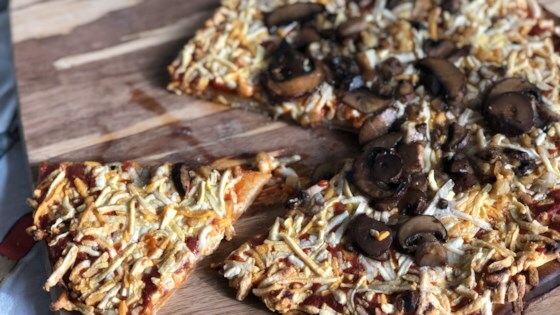 "This simple and basic vegan cheese has that stretchy and melty quality of regular cheese; it looks and tastes great, and is ideal for pizzas and sandwiches." Place cashews in a bowl and cover with water; soak for 4 hours, or overnight. Drain. Place 1 1/4 cups water in a saucepan over high heat; bring to a boil. Add agar-agar powder and mix well until fully dissolved. Let it sit for 10 minutes. Combine agar mixture, soy milk, almond flour, vegetable oil, miso, lemon juice, vinegar, salt, and pepper in a blender; blend until smooth and creamy, about 3 minutes. Place mixture in a saucepan over medium heat; cook, stirring constantly, until it thickens, 7 to 10 minutes. Place in small ramekins, cover with plastic wrap, and chill in the refrigerator until set, about 2 hours. Grate before using. Watch how to make your own feta cheese! This cheese works best if grated, not sliced, and keeps melting after baking, so make sure to let it rest for 5 minutes before serving.